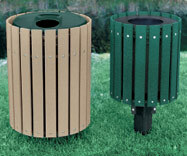 This unique group of trash receptacles is constructed with extended slats that are specially designed to keep them from resting on the turf. These weather-resistant containers have a high density polyethylene frame to prevent rust. The hard plastic lid and rigid liner are included. Available in the colors shown.